・　The National Infrastructure Commission (NIC) is a group of eminent, independent experts whose long-term plan for developing UK infrastructure looks beyond short-term political concerns and provides a clear policy direction for government and investors about what the country needs to thrive and compete sustainably in the 21st century. Professor David Fisk CB, one of the commissioners, summed it up, “Falls in the prices of renewable technologies have made them increasingly viable as one of this country’s main sources of electrical power. 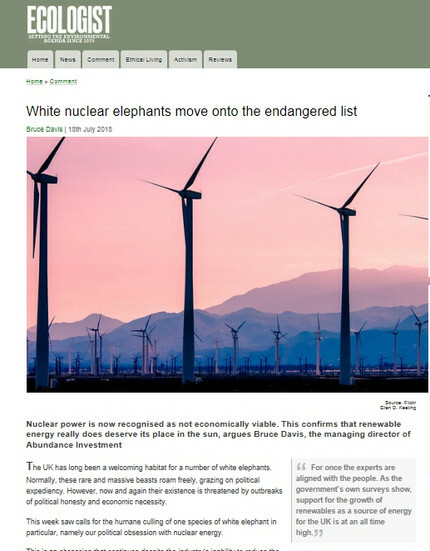 ・　In other words, the sums on nuclear no longer add up when faced with the progress made in the economics of renewables - and the future potential for those trends to continue.